Hi everyone, this is our first blog entry - finally found time and an internet cafe to write an update! After saying our sad farewells in Sydney, we flew to Perth where we visited Fremantle for a few ales in the Little Creatures brewery and rode 20 kms on bikes around Rottnest Island (one of our highlights so far). We then picked up our Wicked campervan (The Jolly Roger!) and took off down south to check out the wineries in Margaret River, the south westerly point of Australia (Cape Leeuwin - where the Indian and Southern Oceans meet) and the southern forests. 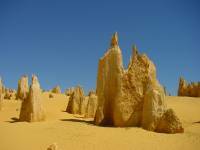 We have now headed north to the Pinnacles (another of our highlights! - limestone pillars in the desert, very random. See picture above.) and have reached Kalbarri National Park - have just had to buy fly nets to wear tomorrow as the flies are unbelievable here! Cafe about to shut - bye for now and love to all!